After what’s seemed like a winter that just won’t stop, we’ve finally hit normal temperatures for this time of year, and the seed started last week are all starting to pop up. Every year I have this crippling fear, which I’ve dubbed “Seed Starting Anxiety Syndrome”, that centers around me being positive that none of my seeds will germinate, and it’ll be a big bust. Of course that never happens, and except for the few odd seeds that are extremely old and have come to me, maybe not stored in the best conditions, they all germinate just fine. But yet, I still have that anxiety every year. I use a website called Folia to log everything as it’s happening. I have no direct affiliation with the site, besides being a fan (and an initial beta tester many years ago), but it’s become indispensable for my record keeping, just to see when everything happens (is that variety actually 60 days to maturity, or was it longer?). If you’re interested in the day-to-day of how the seed bank plants are doing, follow the link above, and you can see it all go down there. 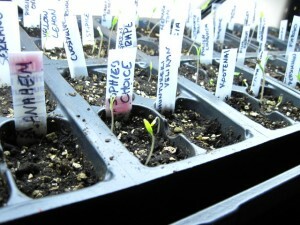 Still waiting on a few tomato varieties, the peppers, and the eggplants. Today I’ll be starting some short season melons, and some squash. As they grow, I’ll be posting more pictures. Stay tuned!